The self-assuredness of my early 20s was quickly shattered when I got laid off at the age of 26. Suddenly, I started feeling lost. I was starting to realize I had been directing all of my energies toward proving that I was an adult (whatever that meant!). In reality, I had no clue who I was. Yikes! Obviously, I missed school the day they taught us about self-awareness. Oh wait, that’s right, they never taught any of us about it! I believe the practice of self-awareness is one of the greatest skills in life because it enables you to learn about yourself in a way no one else can ever teach you. It teaches you how to manage yourself and how to productively engage with other people. Most importantly, it enables you to design work that works for you, so you can design your lifestyle on your terms. Before we dive into defining “self-awareness,” let’s break it down and focus on the meaning of “awareness” first. I like to think of “awareness” as what you notice in life. It’s about paying attention. It’s the details you pick up from your perception of the world. It’s your consciousness actively gathering and processing information from your environment. It’s how you experience life. There’s lots of stuff to notice each day, each hour, and even each minute. Look up from this blog post for a moment and slowly scan the area around you. What did you notice? Which details can you describe? I have a very good friend who notices very different things about the world than I do. I often tell her she could have been a CIA agent because she can recall an astonishing amount of detail from any given scene of life. I’m more oblivious. Well, not really oblivious, just more hyper-focused on one particular part of the same scene my friend and I are experiencing. I tend to be very aware of people. I easily remember people’s names. I feel their vibe. I notice how people interact with each other in a group. I catalog their stories in my brain. I can pick up conversations exactly where we left off even if months have passed. My friend, on the other hand, will notice the physical details and movements of all people, even strangers. I tend to be more aware of people I know or spark my curiosity. Neither form of awareness is right or wrong. They’re just different. It’s our natural tendency. If “awareness” is about noticing stuff in the world, “self-awareness” is about focusing your awareness on yourself. It’s your ability to notice your feelings, your physical sensations, your reactions, your habits, your behaviors, and your thoughts. You are aware of all those different aspects of yourself as if you were another person observing you. Another way to think of it is paying attention to your intuition, also known as your 6th sense or your gut feeling. Or as someone I once interviewed told me, self-awareness is about being honest with yourself. We all have a self-image of how we want others to perceive us. You might view yourself as punctual, but in reality you are often late to appointments. 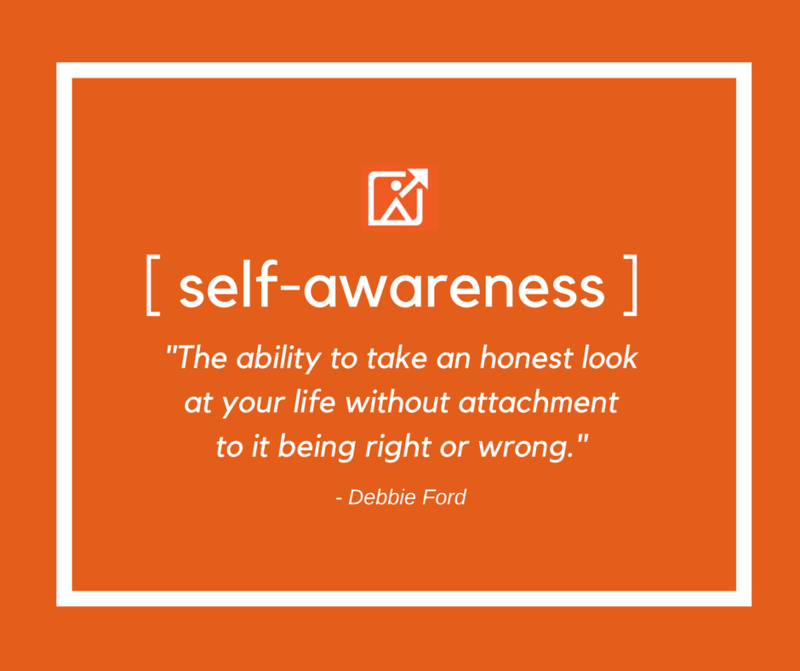 Self-awareness is about focusing on the reality of your behavior and not on the story you tell yourself about yourself. On the surface of their lives, everything seemed fine. In fact, they were able to ignore and even repress this feeling because they didn’t have the self-awareness to explore it. Has this ever happened to you? Some felt a physical sensation in the pit of their stomach or a tingling in their chest. Others felt more and more distracted. People also told me they felt unsatisfied or unhappy, but had no idea why because they could see no immediate reason for it in their lives. Those that started to investigate the source of these unexplained feelings and sensations were those that began a deeper practice of self-awareness. They started observing even more subtle sensations and the nuanced circumstances of their behaviors. They gave their feelings a voice and hushed the monkey chatter of their conscious thoughts. Those that chose not to investigate these feelings increasingly felt more anxious. More stressed out. Exploring the unknown can be scary. We believe we have to have everything “figured out” by the time we are 30. Becoming self-aware about unresolved feelings threatens everything we thought we were supposed to be working toward. I strongly encourage you to stop ignoring those feelings because they’ll never truly go away. Instead, start exploring them through a practice of self-awareness. 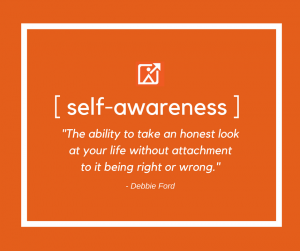 Listen to why practicing self-awareness is so important. In the context of lifestyle design, self-awareness is the first step toward designing your lifestyle around the work you’ve always wanted to do. It is the mechanism for acquiring self-knowledge, the path to learning which habits you need to alter to start working on your terms. We have been taught to shut our feelings out of our decision-making process and to rely solely on our rational thoughts. I believe this puts our decision-making process out of balance. When we rely solely on our rational thoughts, we often make decisions to try to live up to someone else’s ideals. Our feelings are the internal advocate for our own ideals. To make effective decisions, we need both rational thought and our feelings. We need to pay attention to our gut as much as our brain. I didn’t become actively self-aware of my feelings until my early 30s. I suffered from chronic anxiety throughout much of my career, and I owe that to my deficient awareness of my feelings. Ask yourself, “Where is that feeling coming from?” Make a habit of recognizing your feelings. Very simply, start writing down your most positive feelings and your most negative feelings. Keep a journal or note on your phone. Try it for at least 30 days. Begin to notice patterns and trends. This simple practice will help you better define your purpose, your values, your motivations, and anything holding you back from the work you’ve always wanted to do. Here’s everything you can learn about yourself to design your ideal lifestyle. I like to think of monitoring your feelings as communicating with your subconscious mind. It’s your true inner voice. It often knows what you want in life before you are able to put it into words. The third step for practicing self-awareness is expanding your practice to areas of your life beyond your feelings. There are countless areas of your life you can monitor, but you should focus on areas you believe will have the greatest impact on designing your ideal lifestyle. Once you’ve had some experience with tracking your feelings, I recommend tracking your energy next. This will help you identify your “peak performance period” each day. These are the period(s) of the day when you are most energized, focused, and able to create your highest quality work. Tracking your energy will also provide insights into what motivates you and what drains you. Try these 4 self-awareness exercises. Listen now. I know starting a self-awareness practice for the first time can be difficult, so that’s why I created a 12-week self-assessment challenge to help begin your self-awareness practice. Each week you’ll be emailed a new self-assessment challenge that prompts you to explore a specific aspect of your life like how you spend your money or identifying your values. Developing a self-awareness practice is the foundation of lifestyle design. It is the primary method for learning about yourself and your needs. It will also do wonders for reducing your anxiety and preventing you from getting “stuck” in the future.